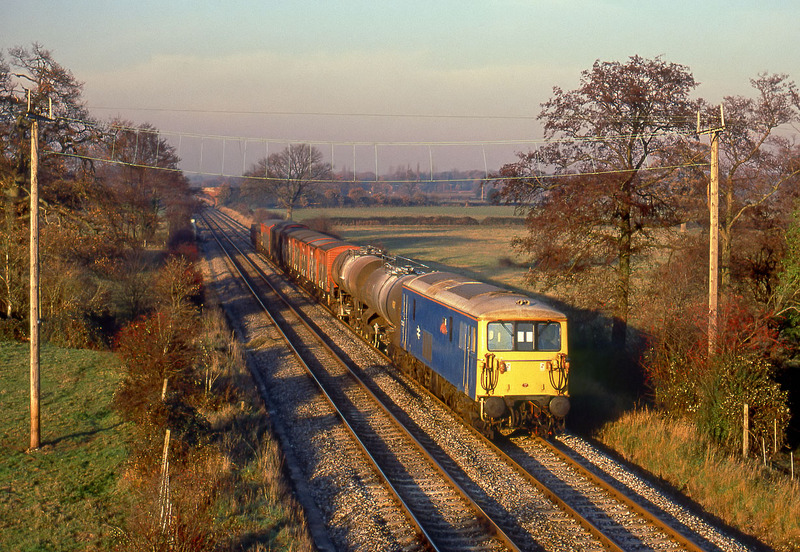 In superb late afternoon autumnal light, 73005 Mid Hants Watercress Line passes Lee with the 6Y48 Salisbury to Eastleigh Speedlink trip working on 30 November 1989. Its 600hp diesel engine was obviously considered sufficient for this working in lieu of the more usual Class 47. The train comprises two calcium carbonate tanks from Quidhampton and an assortment of vans from the MoD depot at Dinton. Probably one of my favourite photographs of the year due to its rarity value and excellent lighting. The unique liveried loco wears all over Network SouthEast blue and to get a picture of it working a mixed freight away from the third rail was a definite bonus.